Some of you may have noticed that we have a fourth follower among us since a few days. Welcome JDMike, and enjoy your stay. As it was the case with the last person to join us before yourself, here is a “special” post to greet you. 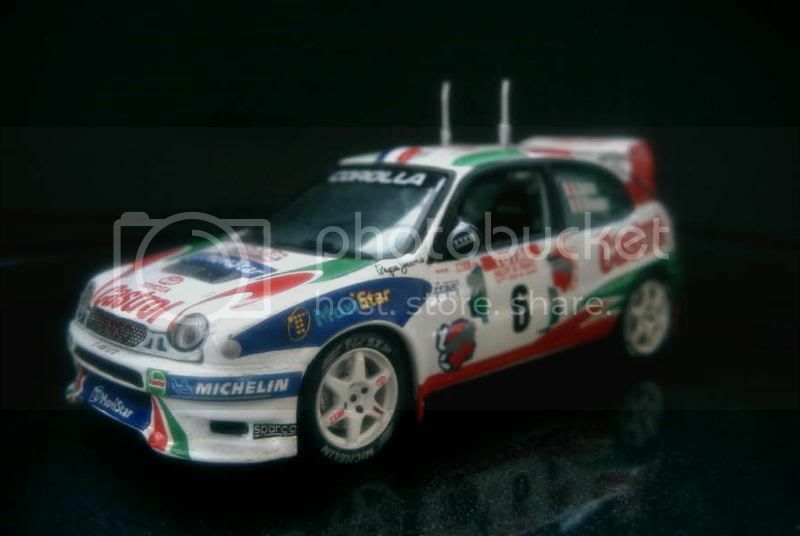 I didn’t present so many rally cars until now, so here is the opportunity! Toyota boasted for a time having, with the Corolla, the most successful nameplate of the world’s automobile market. Nevertheless, when the seventh generation of its popular car was due for a replacement, all that came out was a slightly updated model. Known internally as the “E110” and unveiled in May 1995, it shared most mechanical parts with its predecessor, and even extended this closeness to some body elements. A temporary recession had actually driven Toyota into cutting the development budget of its car down. This didn’t mean that the new Corolla had been badly designed – on the contrary, this was a tasteful and attractive package. The very same name encompassed quite different cars depending on what part of the planet they were delivered to. Known as a very traditional saloon in many countries, the Corolla was often sold as a 3- or 5-door hatchbacks in Europe, fitted with a different front end. About the latter, Toyota had wanted to provide customers from the Old Continent with a more original-looking car. Unfortunately its large, rounded headlights simply didn’t catch on. When four years old, the car received instead a very traditional front end. On the mechanical side, Toyota took no chance, its Corolla being totally orthodox. A choice of inline fours drove the front wheels through a 5-speed gearbox, though some models could be ordered with an automatic transmission. Displacements for gasoline engines varied from 1.3 to 1.8 litre, and larger diesels were also available on some markets. Unsurprisingly, a car bearing such a famous name, sold as the most popular car from the world’s leading automobile manufacturer, couldn’t be a failure. Though its career was somewhat undistinguished, this eighth-generation Corolla sold in huge numbers around the globe until November 2000, when a new Corolla replaced it. The older model was only gradually phased out. 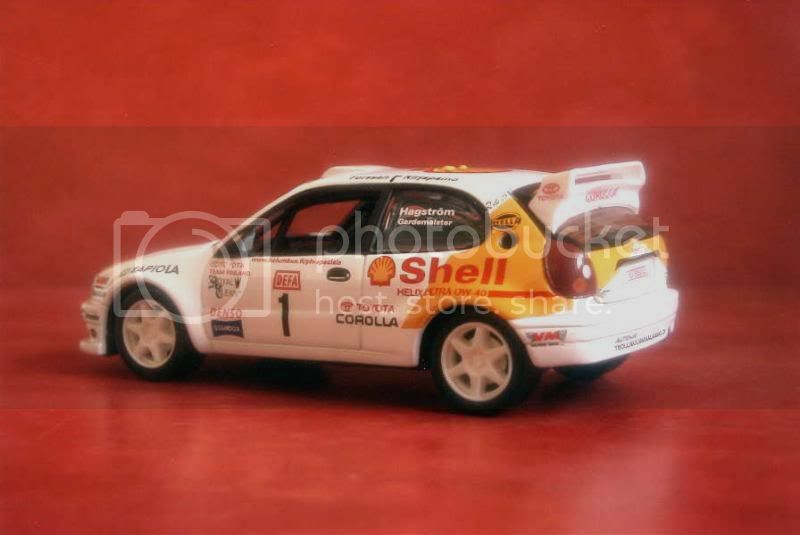 Of special interest is the WRC version of the Corolla. 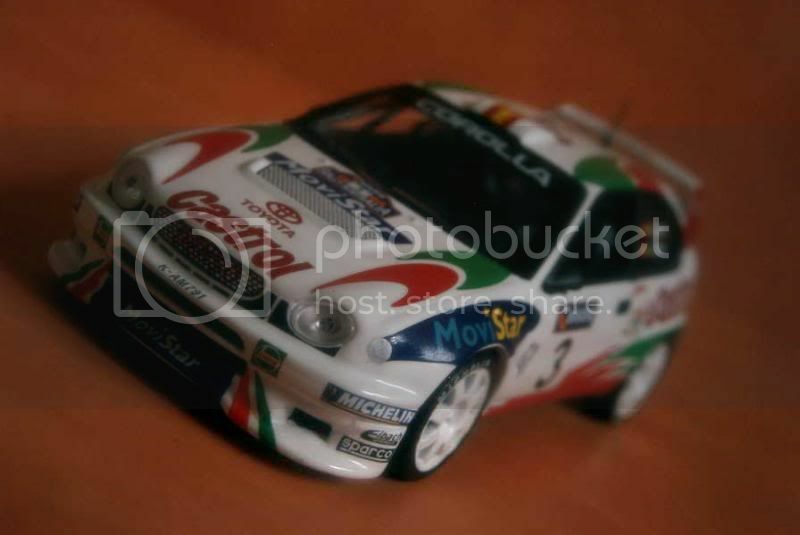 Up to 1997, the chances of Toyota in rallying had rested upon the Celica. The Corolla WRC that would bear the company’s standard would be a totally new car, compact and nimble, in part thanks to its transversal engine – a first in rally racing. Actually, some feared that the very short wheelbase would make the handling problematic, but this proved unfounded. Power came from a turbocharged 2.0-litre four, rated at 299 hp. Transmission was – is it necessary to mention it? – to all four wheels. 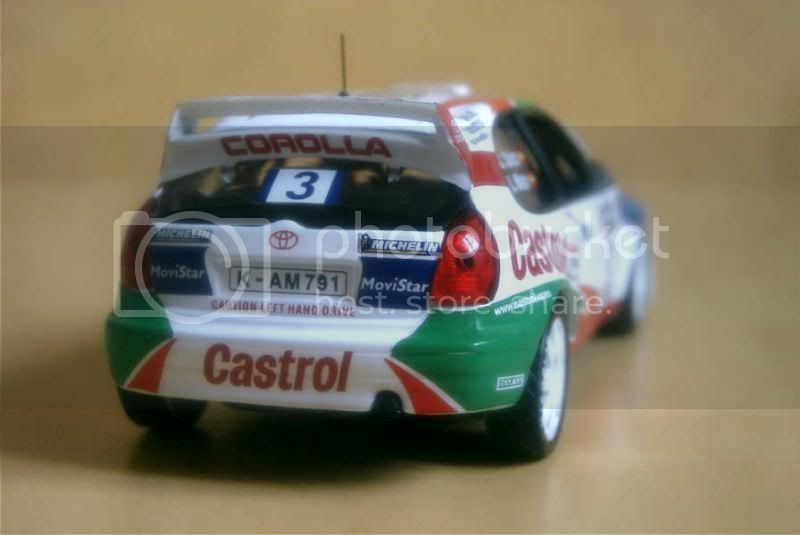 The Corolla WRC undertook its first full season in the 1998 world championship. 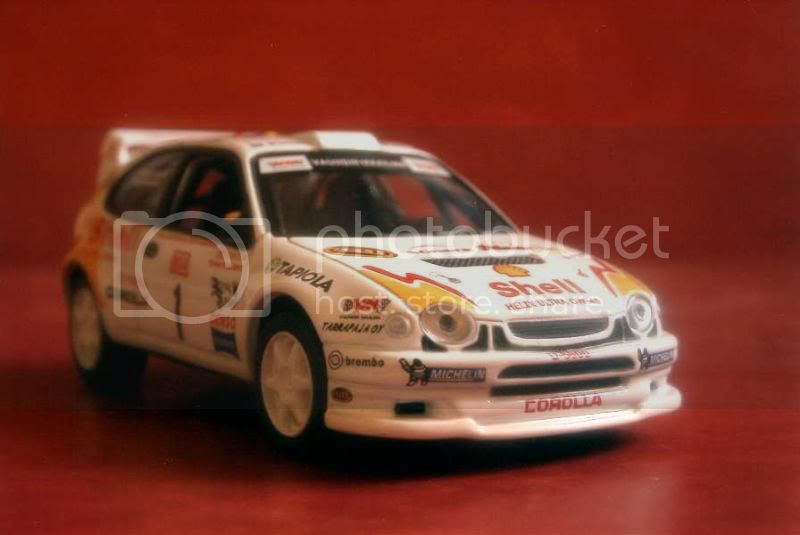 Carlos Sainz challenged Mitsubishi’s Tommi Mäkinen until the very end of the season... or rather a few tens of kilometres short of it, its Corolla giving up within viewing distance of the 19th special stage's finishing line during the RAC, the last event of the season. The Spaniard’s hopes ended up in smoke as did its engine. 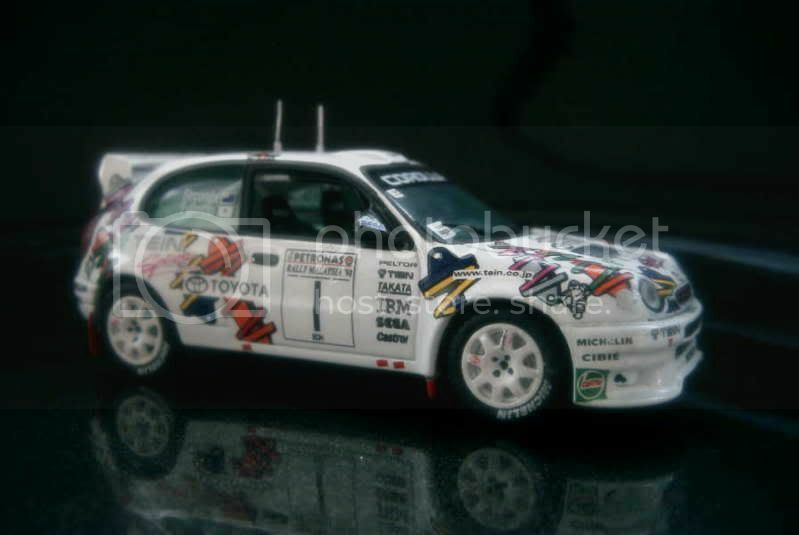 Toyota would finally clinch the manufacturer’s title in 1999, but was unable to add the pilot’s crown to its success. This was nonetheless enough for the Japanese company which announced its withdrawal from the rally scene at the end of the season, though Corollas were entered by private teams for many more years. This model comes from one of the oldest (or rather the oldest?) 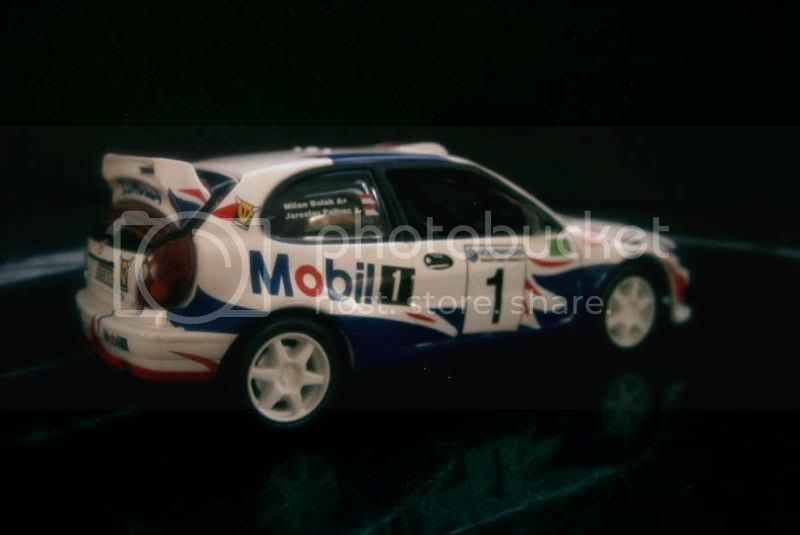 model cars press collection ever released by Altaya. 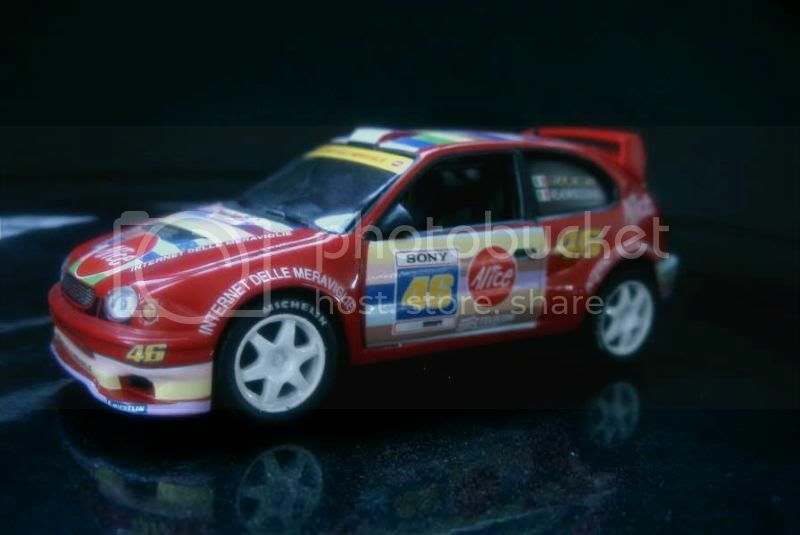 Collectors nowadays ask more from the distributors of these cheap models, which were extremely simplified back then. 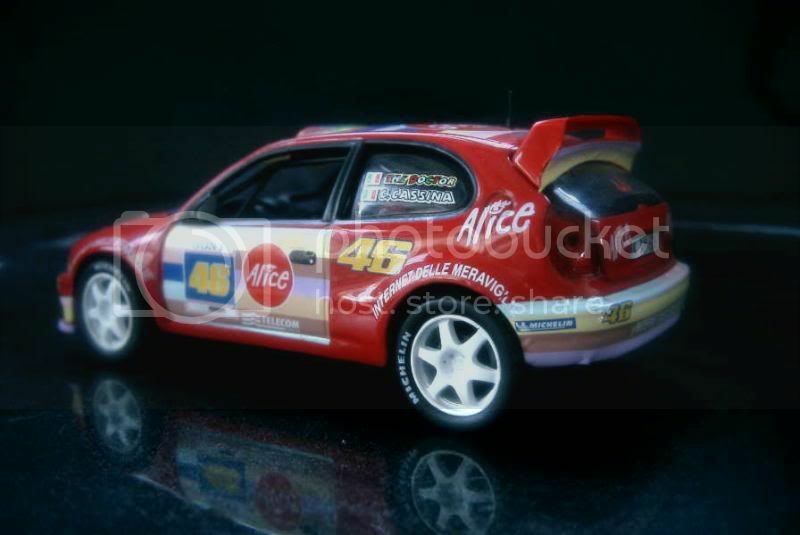 Therefore this die-cast features wholly-red lights at the back, do without a radio antenna, and sports decals of very poor quality – all copies of this model I saw on the net have the same problem, notably their red decals which cover the lower part of the doors. I'll limit my rating to 8/20. 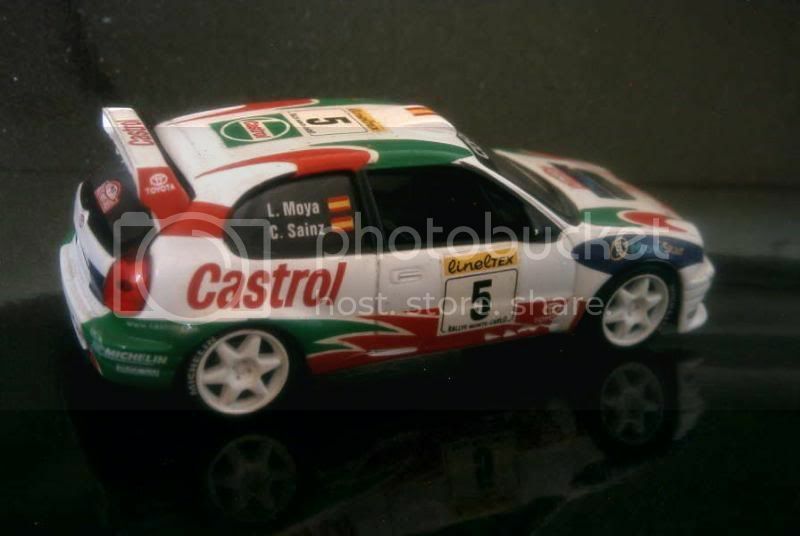 Three months after the Monte-Carlo, Sainz and Moya, along with the rest of the Toyota team, were competing in Spain. This time High Speed made the model. 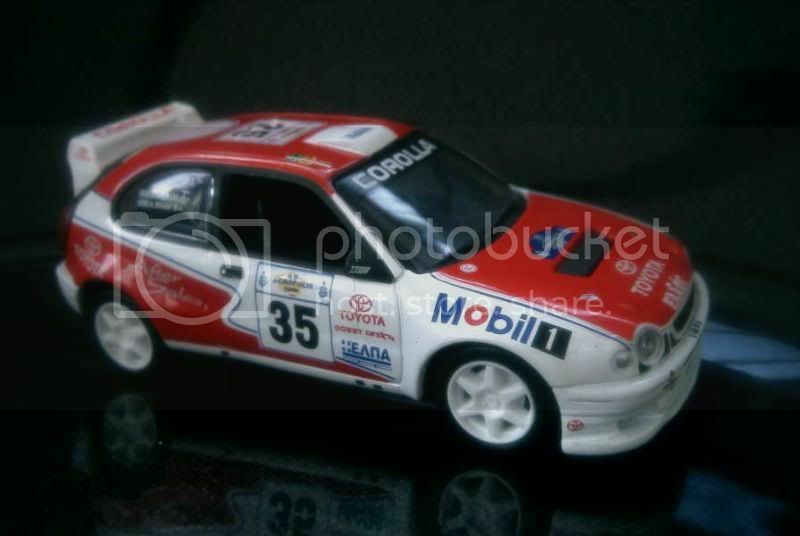 Sold much cheaper than an Altaya/Ixo and half-way between a collectible and a toy, this Corolla nonetheless looks rather nice. My main complaint would go to the rear part of this die-cast, where the whole hatchback and rear lights are made in a single piece of plastic, which seems rather hard to adjust correctly for HS' workers. My rating is 9/20. Correct detailing, but the assembling of the hatchback, here again a separate part, could have been better (traces of glue). As for the rest my remarks are the same as for the Skid model below. Rating: 11/20. 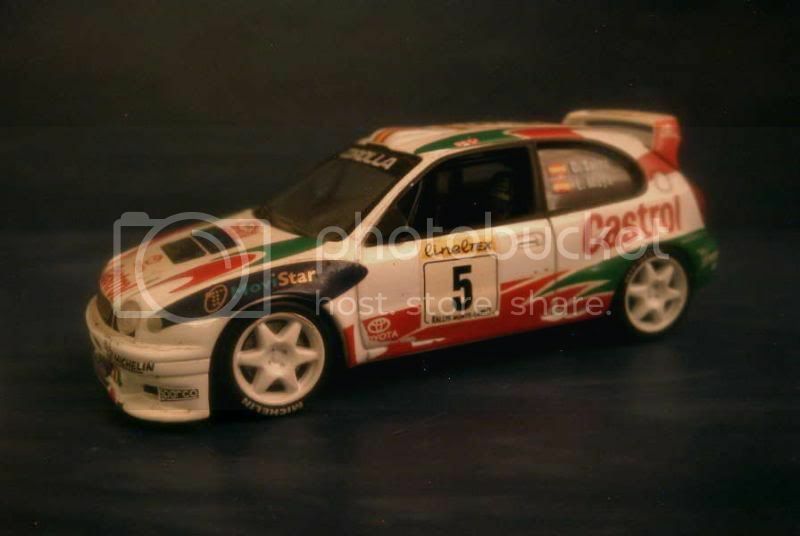 ...High Speed's good idea is, on the other hand, to have multiplied the versions based on its Corolla mould, offered in liveries rarely seen, driven by pilots seldom known. I'll give an extra point for its originality, this time bringing the mark to 10/20. It seems more than deserved as though this model is simple, the quality of its decoration is beyond reproach. 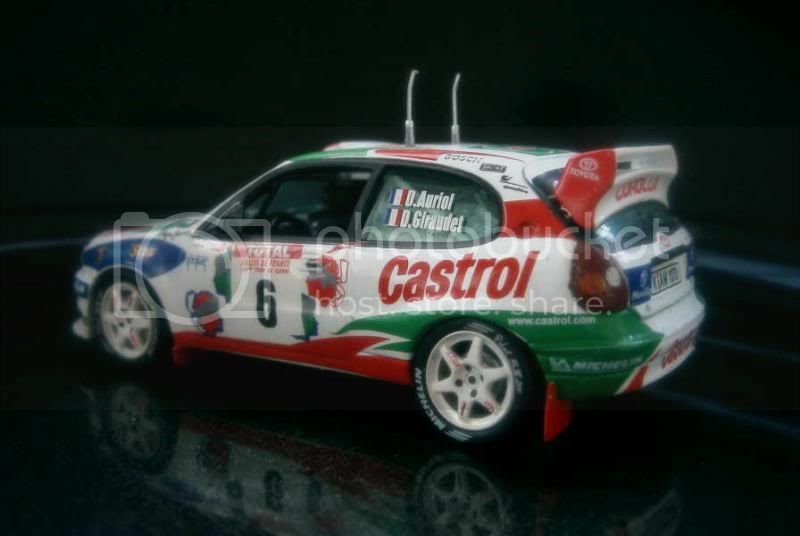 Skid didn't lack originality either when it chose to reproduce the car the Tein team entered at the '98 Petronas rally for Fujimoto and Sircombe. It represented the rear end in a similar way High Speed did with its own models, but succeeded in better adjusting the parts together – considering the difference in price, it is the least you could hope for. 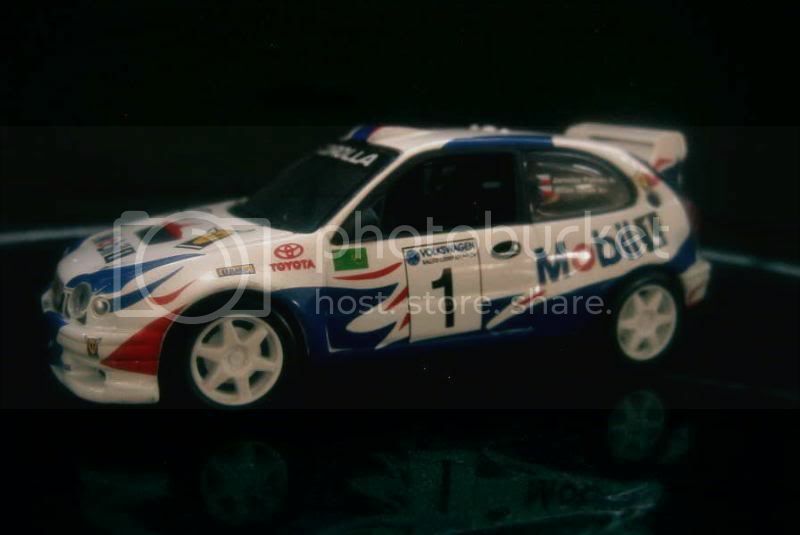 The absence of "real" front lights, replaced by decals, is rather surprising. On the other hand the presence of some details (antennas, flaps behind each wheel, exhaust, decorated wheels) makes this model more appealing than Altaya's. My rating is 12/20. Palivec and Dolák led from start to finish with their HRS Team Corolla during this Czech event. I'll again give a 10/20 rating to this model, for the very same reasons as those given above. 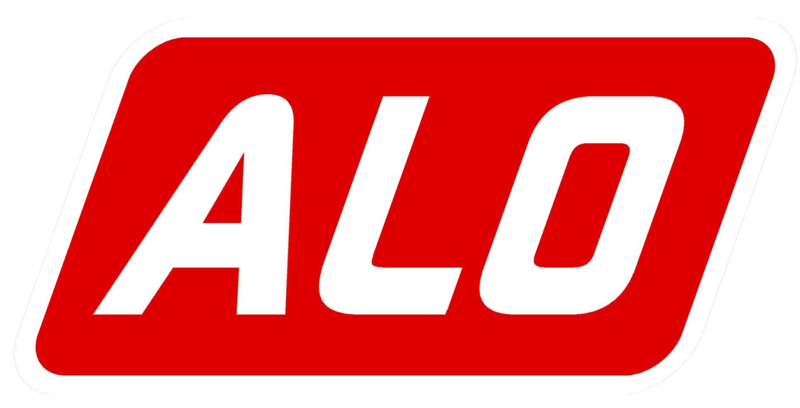 A Spanish company, Altaya doesn't show the same originality in its choices, most paying homage to national champion Carlos Sainz. This later model compares favourably to this one shown above. Rear lights were still entirely red, but some details had been added and quality was improved. My rating is 11/20. A magnifier would certainly help, but until now I failed to identify beyond doubt the event entered by this car. The assembly of this High Speed model is better than the variants of the same brand presented above, while its decoration is cleanly applied, so I'll push my rating up to 11/20. Altaya didn't ignore this, and cleverly removed the word “Show” from the stand of its model... About the latter, Ixo seems to have had some trouble with the decoration - a very busy one, it has to be admitted – but nothing serious. I'd be rather interested to know why the Chinese company fitted its car with an antenna – as shown by the pictures of the actual car (you can see for yourself here, here or here) it didn't have any... Too bad while so many Ixo/Altaya models lack one for cost reasons! My rating would be 11/20. P.S. You'll tell me that this antenna detail really obsesses me... 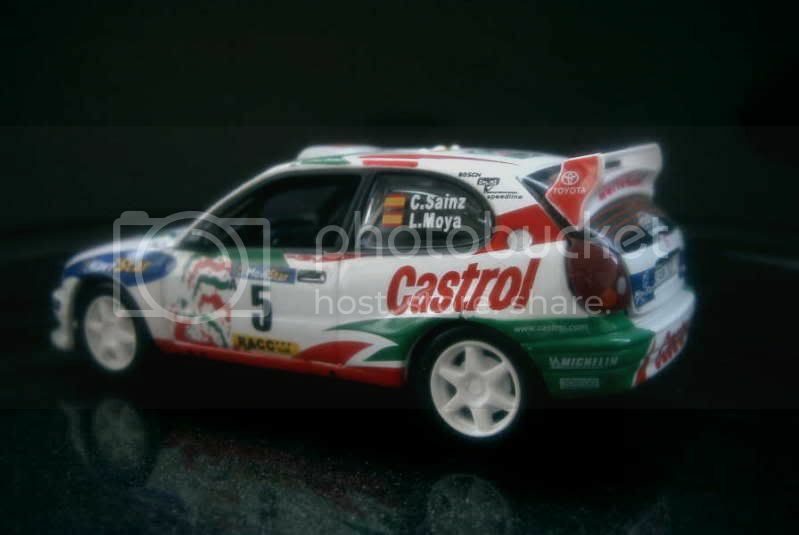 I found here a picture of the regular Ixo version of this model (ref. RAM164), and it doesn't have any antenna. Most of the time you pay extra money to have a more detailed model... while some other times you need to pay extra to have these details removed! love all your Corollas Sir! 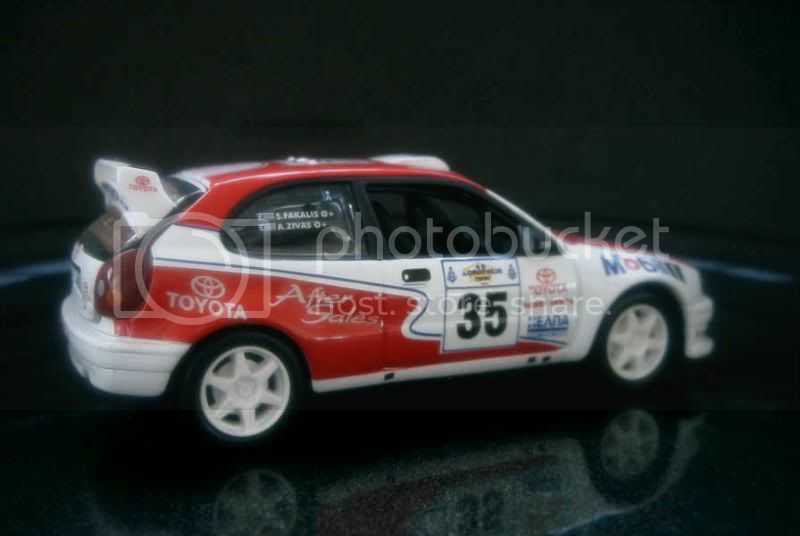 :-) I'm still thinking about getting that Corolla Rossi version or get the black Subaru version of Rossi. 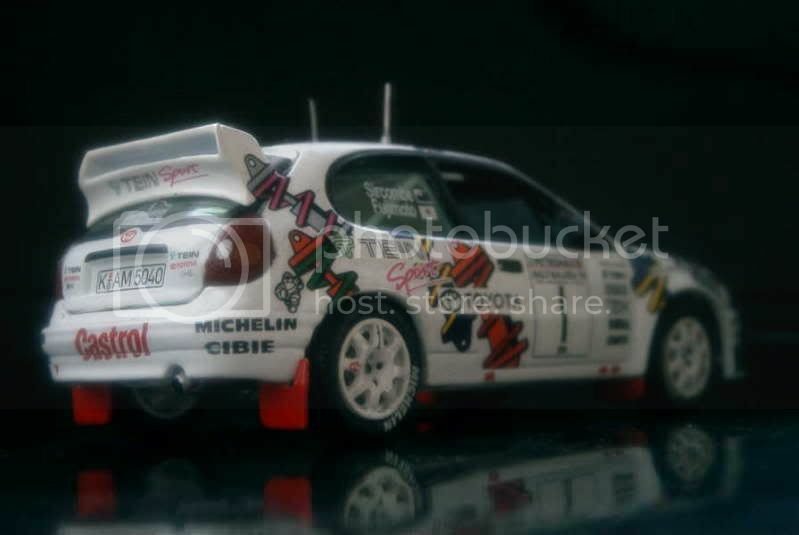 I hope to see more of those 43 rally cars of yours that I saw in a pic that Junji posted awhile back. 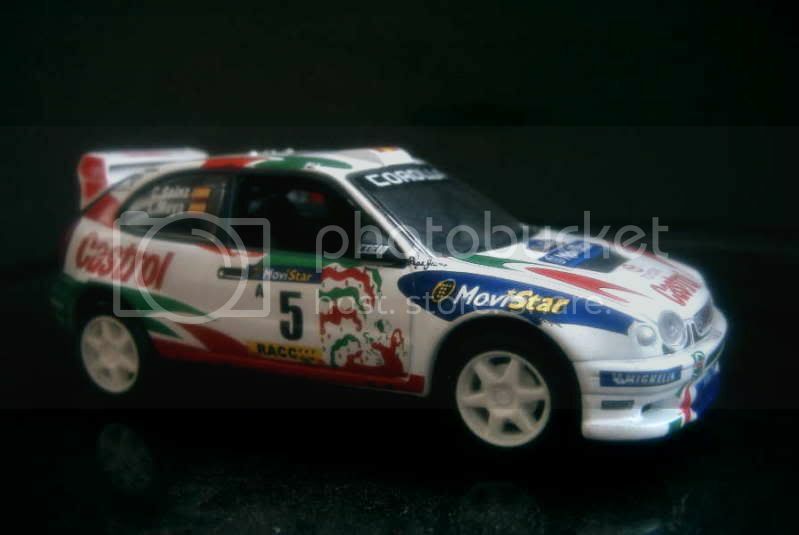 I'll see what I can do about rally cars!